Is a digital camera for you? I used to do some underwater photography back in the mid 80's using the original Olympus Trip in an underwater housing made by Birchley products (photos)and yes, Birchley are still going, as is the camera (even after two floods*) but unfortunately the housing isn't. That left me needing a camera, primarily, for obtaining images for this site. As is my way, I set about finding out what was available and what it would do. It took me about 9 months to decide, because I wasn't going to spend my hard earnt cash until I was reasonably sure that my money was going to be well spent. I couldn't find any examples of what the cameras on offer would do in UK waters. I found some sites which would give examples of what could be achieved but these were in "horrible, crystal clear, foreign water's" and probably taken by experts. Hardly representative of what I was likely to achieve in our gloriously murky British waters. Having got a camera I thought I'd write this part of the site in case it might help any of you faced with a similar choice. What I thought I'd do is post some of my (and my club mates) pictures, warts and all to help you decide. Non, of us are experts and we can't recommend any camera or housing over another, nor are we in the business of making scientific, side by side comparisons, we'll leave that to the dive mags. but we can give you are some examples to help you make your choice. 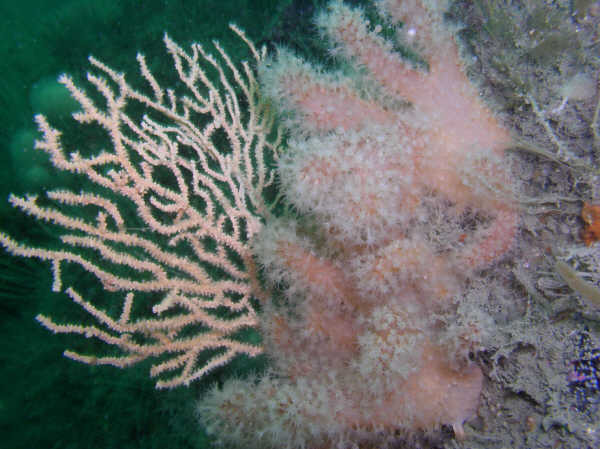 That's a photo taken on my first outing with the camera off Pancara reef in about 4m visibility with a lot of suspended matter in the water, not bad eh? Out of the 82 I took, I considered about 35 to be successful. What camera did I Buy? An Olympus C-4000 zoom in an olympus Housing. * my fault not the housing.